In business, everyone knows how important it is to keep customers happy and to listen to their needs and demands. As a company who works closely with the private sector we rely heavily on feedback from our customers which help us to grow and maintain our company. We beleive that recommendation is the most important and valuable way of acquiring new customers so we've added some of their comments onto our Testimonials page for all potential clients to see. 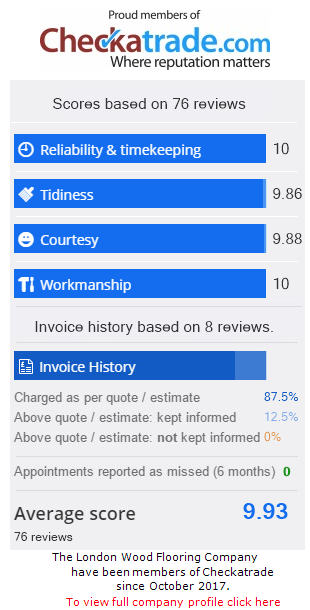 At the bottom of the page you'll also find a link to our feedback comments from our profile on Checkatrade.com. All testimonials are 100% genuine and have been sent to us with full permission to use on our website. We'd like to say a massive thankyou to all of our customers who have given us permission to use their feedback comments on our website. Very happy with Jamie's work. He was reliable and punctual and always keen to make sure that I was happy with the quality of his work. He fixed our solid wood floor that had not been installed properly originally by a different tradesman and we have had no problems with it since. Happy to recommend The London Wood Flooring Co to other clients. Jamie came to view the job, and spent about half an hour discussing my options (and prices for the flooring). When his team came to do the work, they were polite, helpful, prompt and efficient - they were willing to explain what they were doing every step of the way, and to answer any questions i had. They were punctual and tidy, and my floor looks beautiful now! Just to say what a great job, also customer service attitute excellent, would highly recomend. The fitting team were polite and the job was done on time and to a good standard. An excellent job, a craftsman who knows his job, beautiful finish, all the difficult cutting around the stairs and hall is done to the highest standard, my neighbours are going to book them for their new flooring. Well done Jamie! The London Wood Flooring Co fitted laminate flooring in my living room and bedroom. Jamie arrived on time to give me a quote and was very flexible with special requests. He is very polite and helpful, always available for questions. He supplied all the materials and always kept me up to date about how the job was going. In addition they even assembled my bed after they had finished in the bedroom, which was a great surprise as they would not have had to do it at all, they just thought I might have found it difficult to do it on my own. I am very happy with the end results and Jamie even provided me with some advice on how to maintain the floors. I would definitely recommend them to my friends or anybody for that matter. Jamie's team has done a great job installing a new floor in our apartment. The quality of the job was perfect and within the estimated timescales. They left the flat perfectly clean and showed great attention to details. I'd definitely re-use The London Wood Flooring co and would strongly recommend them for this type of job. I was very pleased with the work Jamie carried out for me which was sanding my kitchen floor & varnishing. He was very easy to deal with emailing & texting, letting me know if any issues & always on time. I would recommend Jamie- he always left things tidy & cleared up afterwards. The quote was very reasonable for the number of days he spent. He was also very happy to come back the following week & do a few little bits that I wanted doing. Jamie is a real find, he's done an excellent job laying our solid oak floor. He was very knowledgeable and paid exceptional attention to detail throughout the job. He was punctual and reliable and always made sure that the site was cleaned up so that we could use the space in the evenings. I highly recommend him and wouldn't hesitate to use him again. Jamie responded to job request promptly.I was impressed from his initial visit. Reasonable price and sound advice. He turned up at the agreed time on the day of the job. The work was completed to an excellent standard. Left our home clean tidy and looking good. Very pleased with the result. If you need Flooring done.. Get Jamie. recommend him without hesitation. I am so happy we chose The London Wood Flooring co to lay our wooden floor for us. We contacted Jamie and he came at short notice and performed a site inspection in order to give us an accurate quote. His quote was very competitive and we decided to hire him based on price, experience and professionalism. Jamie arrived on site on time and explained everything that he and Matt will be doing and also took note of any special requirements we had.Jamie and Matt did the job to the highest level and finished on time and left my property neat and tidy. I will happily recommend Jamie to anyone and have already done so. Highly recommended! Jamie is a tradesman that can be trusted, diligent and work to a very high standard. We hired The London Wood Flooring co to lay down 110sqm of laminate floor throughout a 3 storey-high house. Jamie provided a competitive quote after a diligent site visit and started the work few days after. He ALWAYS showed up on time, worked 100% on our job for several days, up to a point when he was stalled by other tradesmen carrying out work in other parts of the house. He accepted to postpone the completion of the work without problem. He came back on the agreed date few weeks later, and completed the work to a very high standard. We really liked the fact that Jamie is a flooring specialist, and his recommendations demonstrated his long experience in this field.